Easter is quickly approaching, but there’s still time to plan an egg-stra special Easter morning meal, and how fun would it be to wake up to this as a pre- (or post if you just can’t wait) egg hunt breakfast! This simple setup is all about the paper goods. Not all the pictures captured it, but the orange is highlighter-bright and such a fun pop of color! The tablecloth is a piece of fabric that looks enough like grass to me, a pom pom banner makes a simply chic runner, tulips are a fun and simple backdrop, and a breakfast spread will help complete the table! Fuel up and get hunting for those eggs! How sweet is this blue and pink Easter bunnies party? It all came together through the insane amount of Easter paper party goods I found myself buying, and with two sets of plates that fit the theme perfectly, one became an easy DIY backdrop. A backdrop adds so much to your theme and it doesn’t need to take a lot of effort or money (but sometimes a lot of tape!) Scroll on for all the details and easy snack ideas! When you love cute little egg cups, but hate hard and soft-boiled eggs, it’s easy to find other things to put in them! Here are some easy mini cupcakes with frosting in-between each layer. Dirt cups get an Easter pick-me-up with edible wafer grass, Peeps, and a candy egg! I found these cute, scalloped baking cups at my local HomeGoods/T.J.Maxx and they are amazing! You can go ahead and put your cupcake in them OR they are coated enough to hold much more, like ranch or other sauces. Thanks for looking! Tag me in your own Easter party creations on Instagram @designorganizeparty and see more Easter fun below! It hasn't felt much like spring here thanks to a giant snowstorm we got yesterday, but with Easter less than a week away (yay! ), it's time to hop to it! This simple color block Easter table is easy to recreate and is so eye-catching and fun! Scroll on to see all the details. Easter grass is a fun, easy, and inexpensive way to create a runner-effect on the table and really help solidify the color palette! Ribbons and washi tape were great to wrap around the top of each glass to add in a touch of even more color! As always, thanks for reading, and happy Easter! 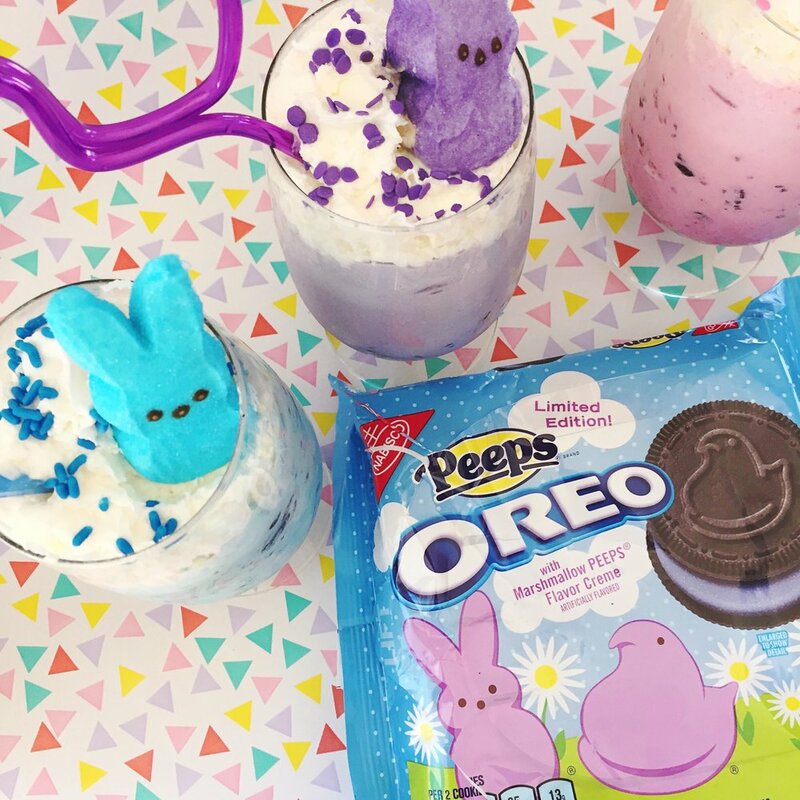 These adorably colorful Oreo Peep Easter shakes are seriously the cutest! I'm not a Peep eater, but they're such an Easter icon and so cute (even though their sweetness give me an instant toothache). I was roaming the aisles of Hobby Lobby and saw these Peep-colored krazy straws and thus, the Easter Peep shake was born. First, crush up your Oreos and put a nice layer on the bottom of each glass. Mix up ice cream, milk, and food coloring for each respective Peep color. Fill the glasses and top with whipped cream, sprinkles, and a Peep! Easy enough, right? And they're such a cute addition to an Easter party or just to be festive throughout this spring season as we move into the warmer temps!